Most of my ministry in Davao City is teaching other Protestant Christians: Pentecostal, Baptist, Reformed, and non-denominational community church clergy and lay members are all among my students. The Philippines is a largely Roman Catholic country. Partly as a result of this, Protestant pastors do not wear clerical shirts or vestments. My own practice here is to eschew the trappings of Anglican clergy unless I’m actually functioning in an Anglican service (as, for instance, during the visit from our bishop, when we held a service of Holy Communion at Faith Academy). To walk around town dressed in a clerical collar would mean being mistaken for a Roman Catholic priest, with all the expectations that go with that. But if we go to another country, I will probably dress like an Anglican clergyman 7 days a week. And for that purpose, it is nice to know where to get vestments and clerical clothing made. Just down the street from Faith International Academy, in a building I drive past every day, is Colors Crew, a tailor shop specializing in vestments. I showed the seamstress one of my Anglican dog-collar shirts and asked her to make four like it, but with long sleeves for next year when we are in the States. On the same visit, I showed the seamstress the purple batik cloth I had bought in Jakarta last October. 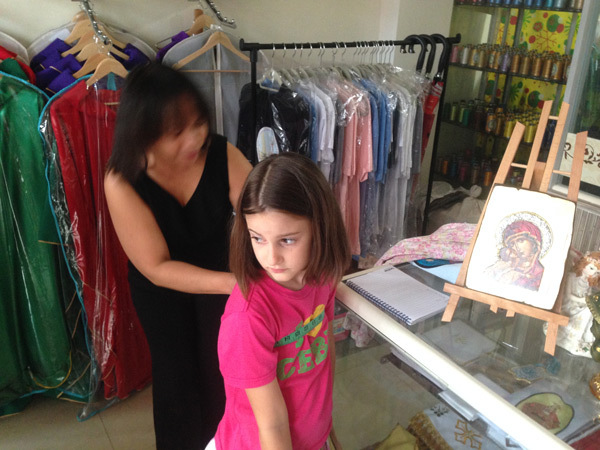 She was delighted to measure both our daughters for sundresses, to be made with the batik I provided. I’ll post the results in the third week of February when the dresses are done. Below: Hosanna getting measured, next to a picture of the Theotokos. This morning, I’m writing thank-you notes to some our our senders who have extra support in December and January. 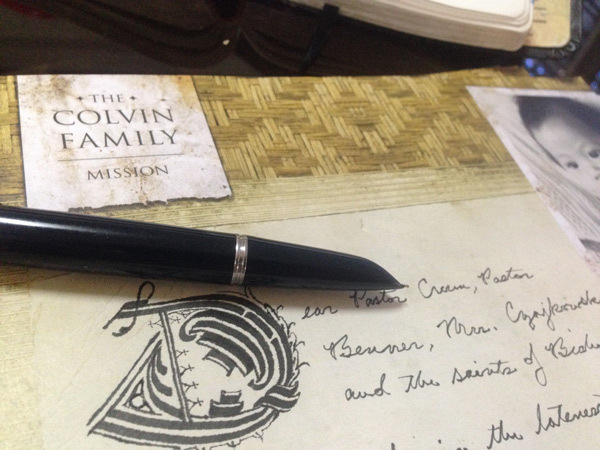 I fill my fountain pen, get out the stationery and write a page or two for each, making sure to include a little bit about how our ministries are going, and how our family is doing. For a missionary with good support, this is a very pleasant way to spend a morning. There is a natural and Biblical link between missionaries and their senders: the missionary is not doing his own work, but the work of the Church. The parish or congregation needs to know what the missionary is doing, not only for accountability, but also so that the members can grow in their relationship to Jesus through this involvement in the work of missions. Thus, communication by the missionary is essential: it is how the sender is connected to the work that is being done far away. But there is a secondary effect: when senders are well-informed and connected to the missionary, they are able to encourage and support that missionary more effectively. In the age of email, this is easier than ever, but I believe that there’s also a place for handwritten ink on paper. Our family is considering a placement in another country after our home assignment in 2016. There are many days when the stresses of the foreign mission field make the idea of signing on for another three year stint daunting. But having a great group of senders is a huge spur to further missionary work. (By contrast, I imagine that having poor support would be a huge discouragement and an excuse to leave the field. Fortunately, I can only imagine!) Thank you to all our senders and supporters. You have been exceedingly faithful, and that encourages our family to gird up our loins and look for what work the Lord may prepare for us to do.